Dr. Ababouch is a distinguished alumnus of the College of Food, Agricultural, and Natural Resource Sciences at the University of Minnesota. 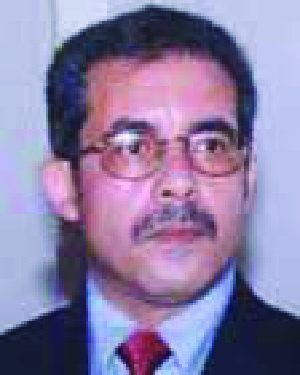 Dr. Ababouch came to Minnesota as a faculty member of the Institut Agronomique and Veterinaire (IAV) Hassan II in Rabat and graduated in 1982 with a Ph.D. in Food Science and Nutrition. Dr. Ababouch is Chief of the Fisheries Industry Division at the Food and Agriculture Organization (FAO) in Rome. His work has focused on the safety and quality of fisheries products and the introduction of systems that have helped developing countries better supply the world's fish markets. As a result, these countries have seen an increase in earnings and technological developments within the fish processing sector, which have also been a benefit to local fish markets. On his return to Morocco, Dr. Ababouch rose rapidly through the ranks at IAV to become Chairman of the Department of Food, Microbiology, and Biotechnology. He developed new courses on quality assurance of food products and coordinated international and national continuing education courses. His research has helped his country and the fish industry and his publications have made him an international leader in food safety. In addition to teaching, he has conducted a number of research projects. In 1991, USAID and the government of Morocco signed a seven-year development assistance grant to fund the Morocco Agribusiness Promotion (MAPP). Dr. Ababouch was the team leader for this high-profile project. In naming Dr. Ababouch a recipient of the Distinguished Leadership Award for Internationals, the selection committee honored his seeking of opportunities to transfer his knowledge beyond his homeland and making significant contributions to global seafood safety. His contributions have had a global impact, making him a distinguished leader in the world of seafood safety.